What is wire ampacity and how do you find ampacity rating? A sample of NEC ampacity rating tables. Image courtesy of USA Wire & Cable Inc. When selecting a cable, one must know its wire ampacity rating. This rating has been determined by the NEC (National Electrical Code), which lists ampacity ratings for real-life installation examples. Most cable manufacturers provide ampacity tables on their websites. Other organizations that supply ampacity tables include IEEE (Institute of Electrical and Electronics Engineers), which offers more than 3,000 ampacity tables for extruded dielectric power cables rated through 138 kV and laminar dielectric power cables rated through 500 kV. 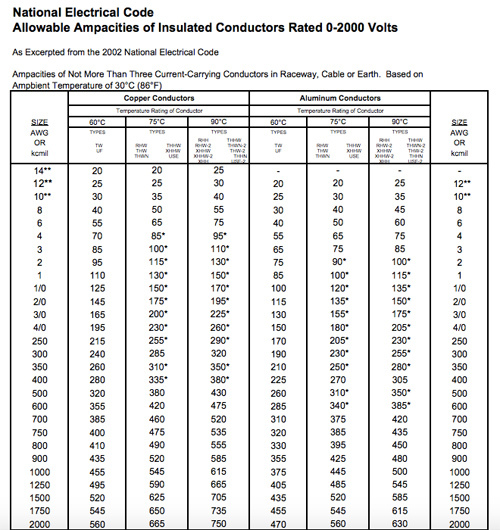 This rating is the maximum allowable current that a conductor, its jacket and insulation can carry without compromising safety at ambient temperatures. Each cable and its jacketing and insulation is rated for specific temperatures. As current moves through a conductor, heat is created. If the heat exceeds the cable’s rating, the cable could fail, even possibly catching fire. To avoid this damaging occurrence, heat must be dissipated outside the cable. If grouped or bundled or enclosed, the Amps running through a cable must be decreased to ensure heat dissipation. Again, ampacity ratings are based upon ambient temperatures. If there is a spike in temperature or if it drops, a correction factor must be applied. If the temperature in increases, ampacity is reduced and if temperature falls, it is increased. Read more about ampacity correction here.